The Jura J5 features several functional advancements making it a great choice for the home or office. The heart of the Jura Capresso J5 is new Ceramic Valve Technology. By utilizing advanced ceramic engineering, the pathway coffee travels within the J5 is substantially reduced, the result is better & hotter coffee with even thicker crema. The compact design of the Impressa J5 features smooth lines with elegant accents as well as cup illumination. This product is discontinued, but you can still check out the Giga 5 Jura espresso machine! Rotary Dial - All functions are centrally controlled by this unique rotary interface. 11 programming options are available and all functions and setting are displayed clearly on a alpha-numeric LED display. You program and control: Cup size, 4 Coffee strengths, Hot water volume, steam duration. Six one touch beverage buttons. LED Display - The 10 digit display dialog system provides very simple instructions, for example: RINSE, FILL BEANS, READY, CLEAN MACHINE. Ceramic Valve Technology - By shortening the internal flow of coffee within the J5, temperature is increased and superior crema is created. The result is the best possible pressure brewed coffee. Brewing process also utilizes a 2 step pre-infusion process for maximum flavor and aroma. The J5 can be set to 2 different brewing temperatures. Butterfly Coffee Spout - Totally original, the J5's dual coffee spout design allows it to move both up and down and in and out. This allows the J5 to accommodate the widest range of cup designs. Large brew chamber - Self adjusting brew chamber brews from 1 to 16 oz at a time. Triple hot water temperature - The unique triple temperature setting for hot water output produces a hotter Cafe Americano, pre-warms your espresso cups and accommodates a greater variety of tea preparation. Advanced coffee grinder - The insulated burr coffee grinder features the lowest noise grinding of any automatic coffee center available today. It also features an electronic bean sensor to alert you before you run out of coffee beans. The upper burr of the grinder is removable for easy cleaning. 9oz. bean hopper. 6 fineness settings. Storage compartment - Covered compartment provides easy storage for ground coffee scoop & dual frother plus. Illuminated brewing area - Whenever the machine is in use, two LED lights shine into your brewing coffee. Advanced heating system - Fast heating 1450 watt stainless steel lined thermo-block can handle continuous use. Quickly adjusts to steam mode for unlimited amounts of steam to froth and heat milk for cappuccino and latte. 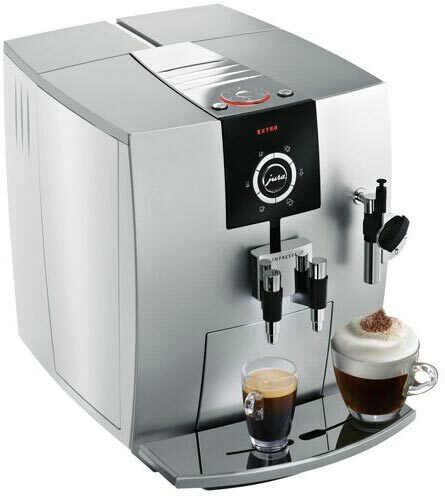 2 Frothing systems - Includes Dual position steam wand and the FrothX automatic milk frother. Water Filtration - Clearyl water care system removes chlorine and other impurities. Eliminates the need to decalcify. Beans or Ground Coffee - Sensor activated pre-ground coffee funnel allows the grinder to be by-passed. Great for the occasional decaf. Large 71 oz. water tank - now with low water indicator. Silver front and top, White side panels. OK, I have been debating and contemplating this purchase for months. I finally bit the bullet and did it. I couldn’t be happier with this machine. My boyfriend and I have said it could make the worst beans taste smooth and bold without being acidic. OK that might be a bit far reaching, but we purchased $4.99/lb organic dark roast espresso beans from Whole Foods and they were still good. This machine grinds fresh for each cup, has excellent performance, cleans frequently to keep your machine in top shape. I was hesitant because of the cost, but you get what you pay for, and it’s well worth the money. Go, do it - buy this - or should I say the later model, since this is, I believe, now replaced with J6. I have been very happy with the unit. The only issue I have had is the grinder getting wet for reasons I don't understand, since the bean holder is sealed, but after using for so many years, I have had no issues of consequence. I'm not much into frothing milk, and seems that there are newer units that likely do this better. owned since 09, have sold over a dozen friends and colleagues on these. i have a second unit for backup for the rare occasion that requires service. only been serviced once in 5 yrs. Makes great coffee; refurbished price makes it very attractive. We have bought a number of these - for our home, vacation home and several of our family - they're great. Great coffee from this machine.